Forza Motorsport - Pre-Order Forza Horizon 4 Now! Pre-Order Forza Horizon 4 Now! Forza Horizon 4 arrives globally on October 2! Players will be able to experience a shared open world where dynamic seasons change everything. Get ready to explore beautiful scenery, collect more than 450 cars, and become a Horizon Superstar in historic Britain. If you’re looking to get the most out of your Forza Horizon 4 experience, we’ve got awesome pre-order offers available now! Here, we’re going to detail the cool stuff available to you when you pre-order Forza Horizon 4. The Forza Horizon 4 Standard Edition digital bundle includes the full game of Forza Horizon 4 and the Formula Drift Car Pack. Look for additional details on the Formula Drift Car Pack in the future. 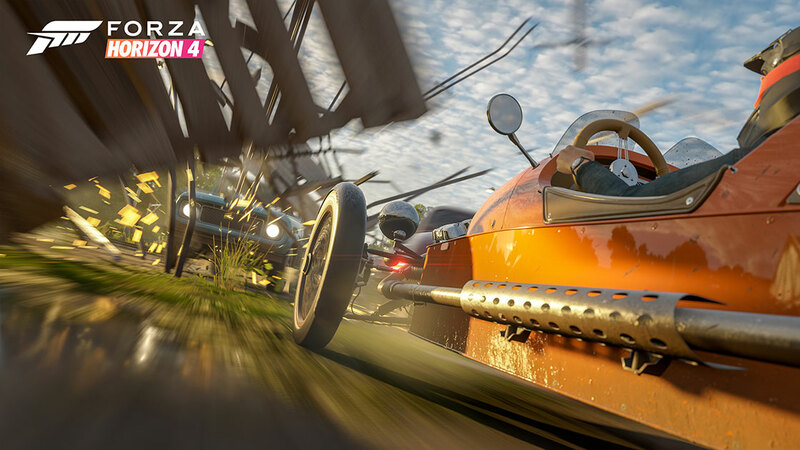 The Forza Horizon 4 Deluxe Edition digital bundle includes the Forza Horizon 4 Car Pass and the Formula Drift Car Pack. See details for the Forza Horizon 4 Car Pass below. The Forza Horizon 4 Ultimate Edition digital bundle includes early access, allowing you to play four days early, beginning September 28. In addition, Ultimate Edition owners will also have access to the Forza Horizon 4 Car Pass, VIP Membership, the Formula Drift Car Pack, the Day One Car Pack, and two game expansions when they become available. See details of Forza Horizon 4 VIP Membership below. Look for more information on the Day One Car Pack in the future. Players who pre-order the physical edition of Forza Horizon 4 will also receive special digital bonus cars (check with your retailer for more details). Players who pre-order the physical edition of the Forza Horizon 4 Ultimate Edition will also receive the Formula Drift Car Pack. Get 42 extra cars at one low price! The Forza Horizon 4 Car Pass will deliver two new cars to your game every week over a 21-week period, beginning October 2, 2018. If you start playing the game after this period has begun, all previously released cars included with the Car Pass will be available for your game garage. All cars included in the Car Pass grant you a one-time only, free addition of each car to your Forza Horizon 4 garage, with no additional in-game credit cost. 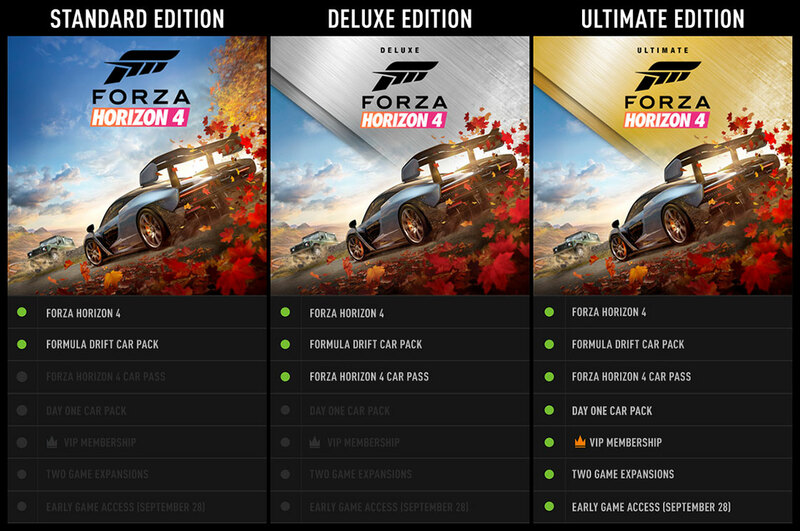 The Forza Horizon 4 Car Pass is included with Forza Horizon 4 Deluxe and Ultimate Editions. Forza Horizon 4 VIP Membership features more exclusive rewards than ever before. VIPs receive 3 Exclusive Forza Edition cars, VIP Crown Flair, VIP Vanity Items, a VIP Emote and Car Horn, a free player house, 2x Credit race rewards, weekly bonus Super Wheelspins, and more. VIP Membership can be purchased separately, or is included with Forza Horizon 4 Ultimate Edition.